Our global population is ballooning, and so are our cities. Driven by urbanization, illegal construction is becoming increasingly prolific and profitable. Most illegal construction stems from homelessness, with many urban areas in developing countries hosting enormous slums that lack essential services and infrastructure. Some individuals look instead to profit from illegal construction, by having their works encroach on nature reserves, avoid permit fees, or profit from those illegal slums with exploitative landlord policies. With many developing cities becoming veritable wastelands, governments are trying to crack down on illegal construction. In developed cities, it’s also a problem – as shady developers take the risk of unpermitted construction in return for permit cost savings and quick profits. This is a multi-million dollar opportunity cost to municipal governments, who are always in need of more tax revenues. However, enforcing construction policies in a timely and cost effective manner has proven to be a difficult task, with governments choosing a wide variety of practices and technologies for doing so. Routine patrol routes planned by the government. Crowd-sourced information. e.g. Districts in Punjab have implemented a community reporting app for illegal construction. Because of the large number and storied history of illegal construction, several different sales channels are used on the internet for illegal construction. Governments sometimes try to monitor these channels. 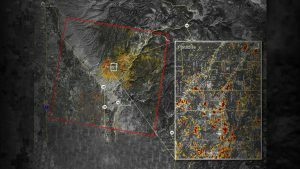 Data analysts study a series of satellite images over a timeline, trying to identify emerging illegal construction sites. The best option is to use aerial imagery, however the cost and time requirements of using expensive geospatial analysts have made this option prohibitive for all but the largest of urbanized regions. 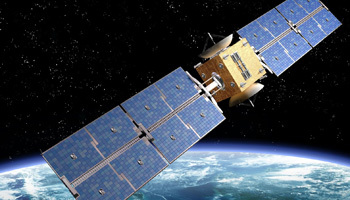 Simularity’s AIADS can process satellite imagery, and detect unusual changes rapidly without the need to hire a team of expensive data analysts. 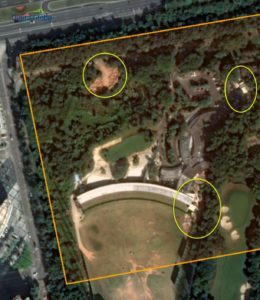 Our AI has proven itself in several examples (available on request) analyzed – from imagery available by various satellite image providers. We have also successfully analyzed drone imagery – a cost effective option for tech savvy municipalities. By feeding images from differing dates into Simularity’s automatic image anomaly detection system (AIADS), the software can pick up and point out key differences without all the noise from the normal changes. 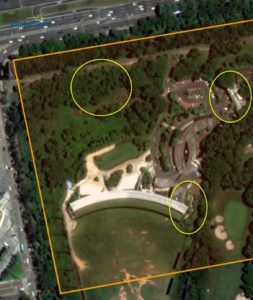 In the following example we recently analyzed some imagery taken over the Shenzhen Golf Club, in Shenzhen China. While our software only needs 4 images to produce optimal results, the imagery included 7 historical images and one recent candidate image. 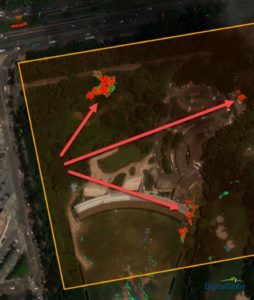 Within just a few hours, our software detected several unusual changes which point to construction and some land clearing near the driving range. As our AI doesn’t interpret or judge what it sees, we are not sure if this was legal or not. The benefit of using AIADS to quickly spot these changes, is that with the time saved there are resources to quickly identify just what is going on… and if it’s legal or not (tax/fine opportunity). Annotations were done by us. 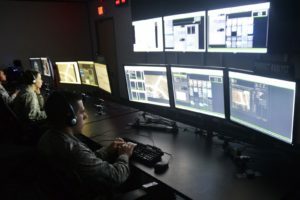 The heatmap in the first image is produced by AIADS. In the above case, AIADS may have detected some illegal land clearing before major construction even started. AIADS is available as a standalone product or in the cloud, based on customer needs, and on DigitalGlobe’s GBDX platform. Contact Simularity to arrange your free consultation today.